Everything is the same as yesterday. No side effects, yet. Woo hoo! However, I have been coming down with a sinus infection since Monday. I’m limited to only being allowed to use my Neti Pot and take Sudafed. Last night, I attempted to sleep in a semi-upright position because the new bed we bought a few months ago has that ability. I still didn’t sleep very well, but I’m hoping this treatment kicks this infection before it gets too bad. I don’t think coughing for the next few weeks will be conducive to trying to keep an embryo attached. I took some pictures of our Menopur process last night. Here’s a shot of the items we have to use. 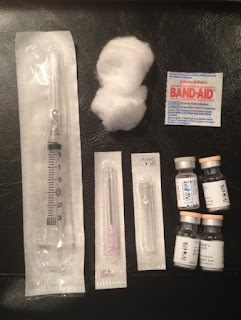 There is a huge needle on the syringe that we remove and save for Progesterone. I really hope it’s just a mixing needle for the Progesterone because it’s big enough to drink a milkshake through! J Okay, I’m exaggerating a little, but it’s huge. 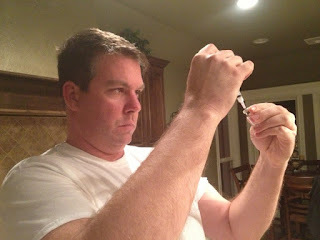 Then, Todd puts on the medium-sized needle to mix the 1 vial of Sodium Chloride with the 3 vials of Menopur. Lastly, he puts on the smallest needle for me to complete my injection. Here’s a shot of my cute assistant. He’s really mastered this mixing stuff. The Scientist...He takes his job seriously! The only thing to note about Menopur is that it definitely burns a little during the injection. Even if you go slow, there are still some sudden shots of burning sensation with it, but it’s really not the worst shot I’ve ever experienced. (The HPV vaccination has reserved that title. That one burns!!) Anyway, also, the Menopur leaves a definite welp and large itchy, red spot near the injection site. I feel like it’s actually the medication just sitting at skin level. I don’t know if that’s true, but it’s what it looks like. I try to rub it to get it to go down, but eventually, I just fall asleep. We have one more Menopur shot tonight, and then I go to the doctor tomorrow. They’ll do a blood draw to see where my hormone levels are, and they’ll perform an ultrasound to get another look at my follicles, I believe. Tomorrow afternoon, I’ll receive more information about my shots for the next 2 days.